I am freshly done, having stayed up late to finish. I am just hanging on a cliff’s edge. What a book! What a ride! It just goes from bad to worse, yet I kept hoping, fearing for Alex, our brave heroine. I ran across the term “unputdownable” when I read a blurb about this book. I have to agree. It is stuck. In. My. Head. WHAAAAAAAT happens next!?!?!?! Alex has a terminal brain tumor. She’s been through treatments and is on a last round of experimental attempts to save her life. She can’t smell anything, feels terrible and is just ready to be done. So she takes a few meaningful items on a final camping trip. She won’t proceed with the experimental PEBBLES. She’s tired. She says good-bye to her aunt and goes on to say goodbye and battle some personal demons. She meets an elderly man, his granddaughter Ellie and their dog, Mina on the trip. Like Alex, Ellie has lost her parents and her only tie to her dead soldier father is his bomb-sniffing dog, retired from the war. All is going well until something happens. Something terrible. In the horrific aftermath of what appears to be an attack by EMP, all Alex can do is try to survive. It’s not the same world: modern electronics have been utterly destroyed, including medical devices like the pacemaker that killed Ellie’s grandfather. No phones, no iPod, nothing. Faced with keeping Ellie safe and enduring the wilderness on dwindling supplies, Alex makes a horrifying discovery. Hint: the kids are NOT alright. And few other people are. And Alex is not the same. 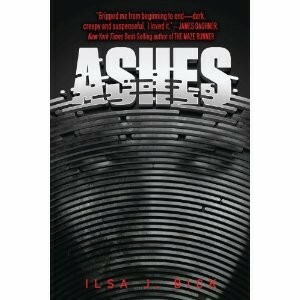 I don’t want to give too much away, but Ashes will be a trilogy. The second is Shadows and the third is Monsters. I. Can’t. Wait. This entry was posted in Books and tagged dystopian, EMP, fiction, Ilsa Bick, ya fiction, young adult by S.D. McPhail. Bookmark the permalink.